From birthday celebrations to loved one’s nuptials, nothing is more elegant than one shoulder dresses. They’re incredibly stylish and right on trend for the season ahead. Find your favourite from our stunning new edit and fall in love with this eternally chic neckline. Now that spring has finally arrived, these mini length one-shoulder dresses are the perfect addition to your wardrobe. 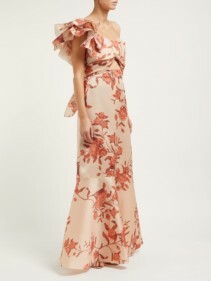 Embrace the season in the Esther one shoulder floral dress by Isabel Marant Etoile. This vibrant blue cotton mini dress boasts a flattering wrap silhouette and a decorative ruffle hemline. 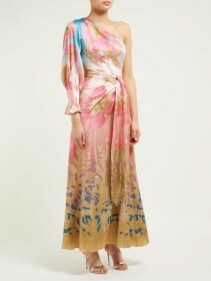 It’s also printed with a playful pink floral pattern which we simply adore for the current season. 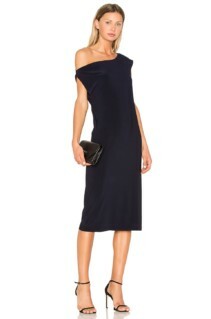 Additionally, the one shoulder sleeve has subtle volume and gathers neatly above the elbow. 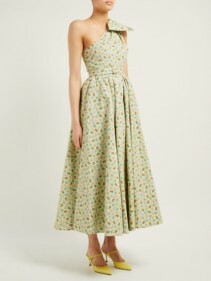 Style this dress with ankle boots or heels this spring. 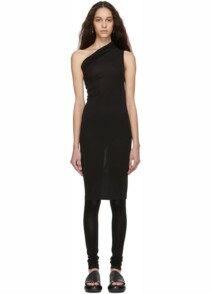 Show your wild side with the adventurous Naven Cara brown dress by NBD X. This stylish mini is fully lined and fitted to perfectly sculpt and emphasise your figure. 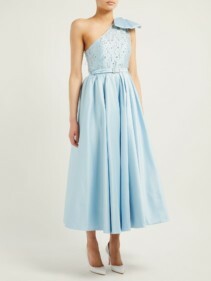 It also has a playful cut out on the waist and an exposed side zipper. We recommend styling this with heeled sandals to elevate this wonderfully eye-catching dress! 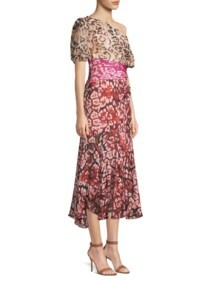 One shoulder dresses are perfect in any length but paired with a midi hemline they instantly become even chicer. 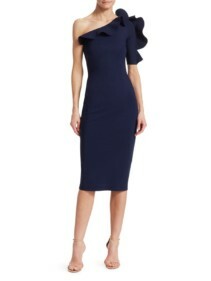 One simply perfect example is the Aleece ruffle sheath dress by Chiara Boni La Petit Robe. This deep navy blue midi is fitted to perfection. 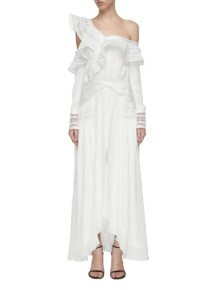 It has an asymmetric neckline with structured ruffle darts, one elbow length sleeve and a sleek, tailored finish. Finally, this amazingly versatile dress is as perfect for romantic dinners as it is for corporate functions. Style with simple heeled sandals for a classic finish. For those who adore playful yet classic prints, we recommend the ruched gingham twill plaid dress by Jonathan Simkhai. This attractively fitted dress offers a ruched centre line and large ruffles along the hem. These details frame and draw attention to the thigh-high split whilst adding a playful twist to a classic silhouette. 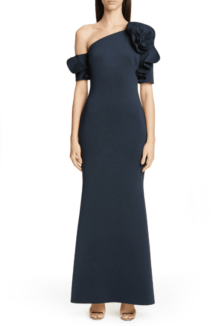 Finally, the voluminous elbow length sleeve provides the perfect finishing touch to this bold and beautiful midi.